Your workforce is mobile. Your time tracking should be mobile, too. Coming into the office to punch a clock just to leave again to the job site wastes time. Paper time cards can travel with you, but they are easy to lose, easy to forget and inaccurate. Times get rounded (up, of course) and after a long shift, it's hard to remember. ClockShark solves these problems and delivers mobile time tracking designed to work perfectly for your mobile workforce. With ClockShark's free mobile time tracking apps for Apple and Android, your employee's smartphone is their time tracker. A few taps on a smartphone or tablet is all it takes to track time. Using the app, they can also switch tasks, take breaks, go to lunch, send you notes, and clock out. It's easier than paper timesheets. It's faster too. They save time and you get accurate data. It's a win-win. Let's face it, tracking time in a mobile workforce is difficult. Most workers on the job site want to spend their time working on their craft, not writing notes or doing paperwork. Paper timesheets are usually the last thing on their minds. At the end of the day, it's hard to remember everything that happened. Paper time tracking isn't a good fit for this type of work. Your workers need another tool in their toolbox that tracks time the same way a hammer puts in nails. ClockShark built its mobile time tracking apps to be that handy tool for strong companies. In fact, companies with a mobile workforce all around the world already use ClockShark. Over 1,000,000 hours were tracked on ClockShark last week alone. Since we're focused on companies with mobile hourly workforces, we only included what really matters and cut out the clutter. That simplicity is why ClockShark's mobile apps can be used right away with no training needed. Open the app, pick a job, pick a task, and push Clock In. That's all there is to it. Simple right? I started using ClockShark to control overtime. Before my guys were using paper timesheets, and turning them in every two weeks. Now I have a real time view of my hours, and can make adjustments to schedules if needed. Also, I really like the Job feature. If we have billable work, I create a job, my guys sign into it when working on that project, and I know exactly what to bill my customer. This has been a great product for us. Having accurate, reliable time tracking data in real time is the difference between profit and loss. Labor costs are likely one of the biggest drivers of risk for your business. Rounded, delayed time records and estimated work progress doesn't cut it. Payroll, job costing, daily scheduling and project management all demand accurate data, now. With ClockShark's mobile time tracking, you can process payroll accurately and quickly, with a few clicks. Your job costing will go from guessing to right on! You can schedule workers with confidence that they aren't in overtime. You can make crucial decisions about your project based on labor costs. We were looking for a mobile app for our field guys and ran across this app. SO glad we found them! The app has been easy to use - easy for the guys to enter their time and job description. Reports have been a life saver in making sure we get all the extras on the job too. When I've had a question about anything, their customer service has been great! You need this app!! Just Download and Log In. Nothing to Buy. You don't need specialized equipment to use ClockShark. That means you can get started testing ClockShark for free without buying anything. You'll set it up and run it through a web browser. The ClockShark website is accessible from any computer, laptop or tablet. Whether you're at the office, at home or sitting on a beach, you can get to your account. You don't need anything special to use ClockShark in the field, either. Just download the Apple or Android mobile app, to set up any smartphone as a mobile time tracking tool. If you decide ClockShark works well, keep using it after your free trial for a simple, low monthly fee. No contracts, no nonsense. Almost everyone has a smartphone. But not everyone. That's no problem with ClockShark. The CrewClock™ feature lets supervisors or foremen in the field clock time for their whole team. Punch the clock for one guy, for a few of them or for the whole crew. You can switch jobs and tasks for them, too. You've got control over all your time punches. Feels good to be in charge, doesn't it? You may know how it feels to wonder where your crews are and be constantly concerned about losing money on time theft. 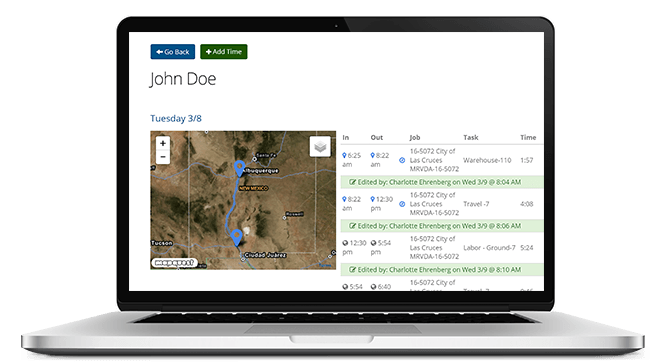 With ClockShark's GPS, you'll always know where your workers are when they're on the clock. You'll know immediately if your crew is at the right job site, and you won't even need to ask them. You'll also get a clear breadcrumb trail of locations during the day, so you can watch where employees go while they work. No more doughnut shop clock-ins, unless they're picking up breakfast for the crew. Got an emergency service call? Find out who's closest with a click. Dispatch them from the Scheduler and send them the address to navigate to. Air traffic controllers have got nothing on you! Love this app! We have about 27 workers in total, I love this app because it lets me see where they clock in. Also they can switch job sites and because we are doing Certified Payroll this app makes it easy all I have to do is just print reports! Need to remind people to clock in or out on time? You can automatically send employees a notification via both email and mobile push notification before their shift starts or ends. Got a last minute change to the schedule? No problem. Update the schedule on the website, then with one click, you can notify anyone affected. No more frantic phone calls or text messages to spread the word. Need to remember to pick up milk on the way home? Just kidding, we can't help you there! We get it. Sometimes your job site doesn't have a good cell signal. That's why the ClockShark mobile apps work great offline. So when your employees are 100 miles from a cell tower, they can still track time. The ClockShark mobile app stores their times and GPS locations until the signal comes back, then syncs automatically. You could build apartments at the bottom of the ocean and still track time with the ClockShark mobile app. You probably wouldn't want to, but you could. Our apps know no bounds. Very easy to use. My employees like the ease of clocking in and out. I now know the hours submitted are accurate. My payroll has already come down by at least 8% in the two months that we have used ClockShark. I would highly recommend ClockShark. Mobile Time Tracking In Your Pocket. Always Available. Always Accurate.